Thank you very much for a great response to my day #3 project yesterday. I am so glad many of you like it and got inspired. Today is #4 of Winnie & Walter’s November release. 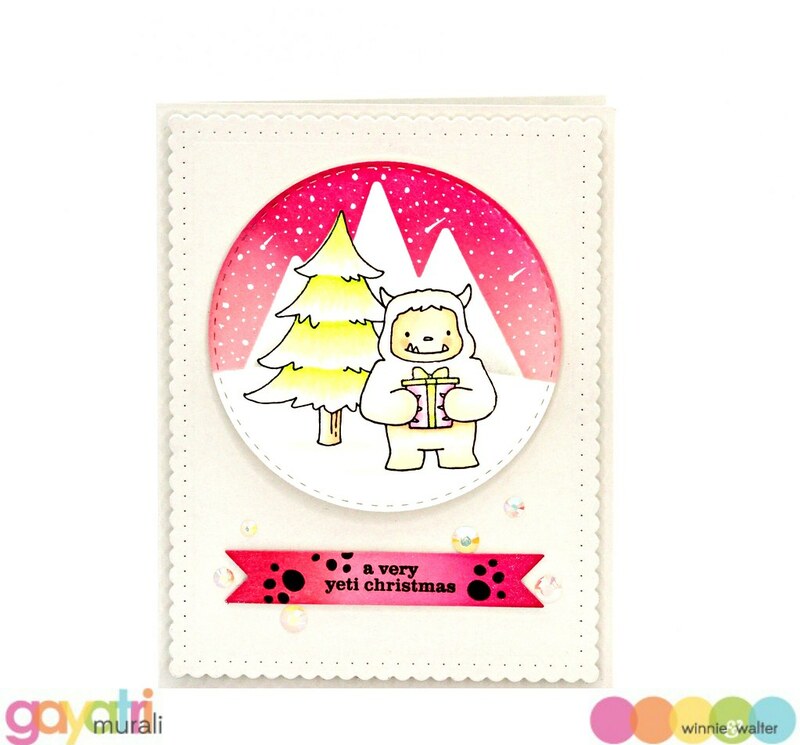 I have another Christmas card to share using the new Yetitide Greetings stamp set. This set also have coordinating cutaways. Mine is in transit and hence I used just the stamp set to make this card. When I don’t have the coordinating dies for a stamp set, I make masks out of the images from the stamp set. 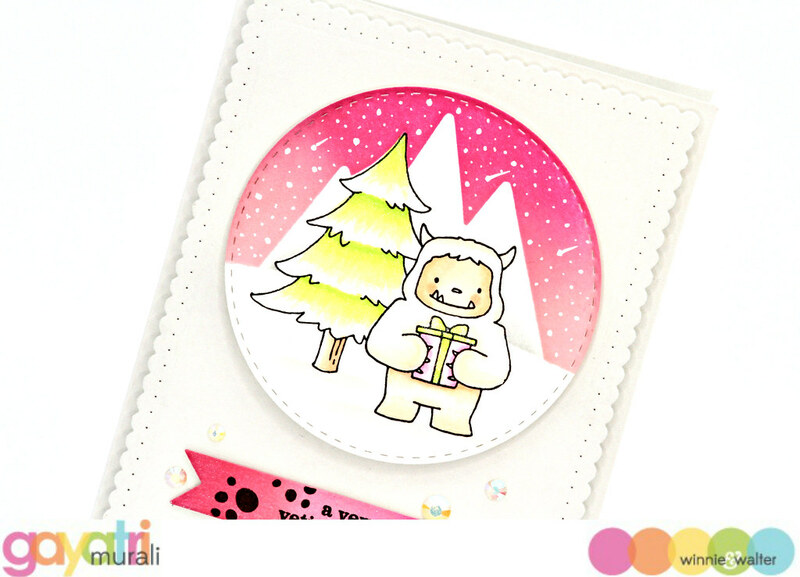 Then I can create scene by stamping, masking and colouring. On this card, I did that in a smaller scale. I die cut a circle and stamped, masked, sponged the background, removed the mask and coloured the images using copic markers. I also added snow on the background using white gel pen. The sentiment from the stamp set on a strip of pink sponged cardstock trimmed with fish tail banner. 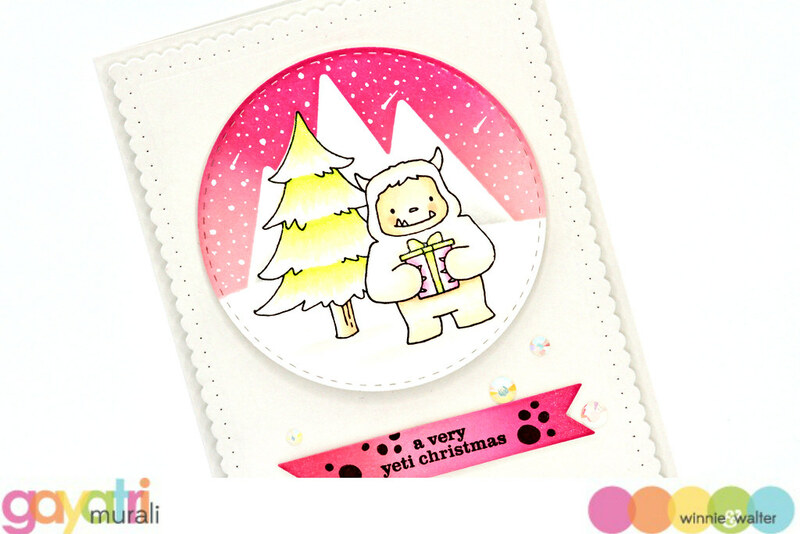 I also stamped the yeti paw image also well on this sentiment strip. I mounted the circle as well as the sentiment strip panels on a gray panel which I die cut using Essentials: Audrey Cutaway bigger scallop rectangle die. The whole panel is mounted on gray card base and embellished with some jewels. Am loving the pink sky at the moment. The pink, gray, white and black combination is subtle with pop of colour. I am in love. I cannot wait for the dies to come in. I have lots of ideas in my head which needs to be put in paper. Check out Winnie & Walter Blog for more design team inspiration as well as giveaway details. Thanks so much for taking the time to visit my blog post.